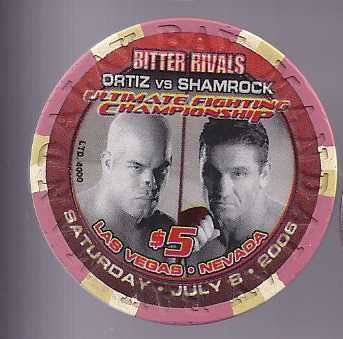 This is a 5 Boxing Casino Chip issued by The MANDALDAY BAY Resort Casino Hotel Las Vegas, NV for the fight between ORTIZ SHAMPROCK, entitled BITTER RIVALS, held Saturday, July 8, 2006. Chip is about 1-1/2" in diameter Circulated, very good condition. Send email if you need additional details about this chip. Buyer is responsible for 3.95 shipping to anywhere in the USA. International shipping rates apply. Visit this store for lots more Boxing Collectibles. Thanks for stopping by!